Everything you need to know about using Films on Demand as a resource or a powerful instruction tool! Access the videos through the link on the Library home page or the link below. If viewing off-campus, just enter your username and password when prompted. Our Films on Demand collection is also now integrated into the CVTC Library catalog, so when you search the catalog and limit to E-Video format type, your search results will include streaming videos. Enter a keyword, author, title, or subject for films and other resources! Find books, DVDs, streaming media, and ebooks in the CVTC Library catalog. FOD provides the citation formats for videos directly below the video playing window. 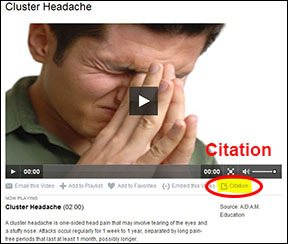 Just click on the 'Citation' link, choose the appropriate style, and copy and paste the citation into your paper. Always doublecheck with your instructor to make sure you are citing according to their preferences. Also consult the citation style guides such as the "MLA Handbook for Writers of Research Papers," and the "APA Publication Manual," for more information on citing your sources. What is Films On Demand? Films On Demand [FOD] is an online collection of high quality, educational videos made accessible to the faculty, staff and students at Chippewa Valley Technical College. Nearly 20,000 titles from top notch producers such as PBS, BBC, Meridian, National Geographic and more! Streaming technology allows users to watch videos on their computers via an Internet connection. Multiple users can simultaneously view the same video at different locations. Works best when you have a robust, high-speed Internet connection. You can find detailed information about the technical requirements on the right sidebar, "Online Help." To get a smooth, quality performance without lags and delay, start playing a video and then hit the pause button to allow the video to load into the buffer for a couple of minutes. The video downloading in the background will stay several minutes ahead of what is playing and will run more smoothly. Then click on the full title in this window. Now you can click on the play button to run all the segments as one continuous movie. You can tell whether you are viewing an entire video or just a segment because a video segment will include "From Title:" which is the title of the full video that particular segment came from. Do not use the URL displayed in the top address bar of the browser as the link you share. Do use the link provided on lower left of the details tab in the video playback window: "Title URL"
To ensure off-campus access, make sure the Proxy prefix is in front of this URL. If you see the prefix "http://proxy.cvtc.edu/login?url=" in front of the URL, you can just copy and paste this link as is. Make sure when copying the URL that you do not copy any additional spaces at the end of the URL because this may cause problems in e360. We are pleased to announce that all of the videos in our FOD collection now have captioning and interactive transcripts. -- New videos may not be captioned when they are first added, but they should be shortly thereafter. -- To toggle captions on and off, just hover in the upper right corner of the video player until you see a pull-down menu. -- To see a full text script of the video's audio, just click on the "Transcripts" tab on the right. -- Click on the words in the script to skip directly to that section of the video. *Video courtesy of Madison College.